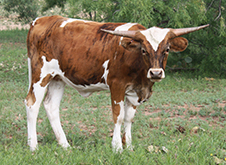 At Red Peak Ranch, we are breeders of Texas Longhorn Cattle and we raise and sell them as easy keepers. That means they have gentle dispositions and can be enjoyed by people of all ages … especially children. 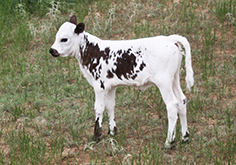 All of our registered Longhorn cattle have solid, proven pedigrees within the Longhorn breed. 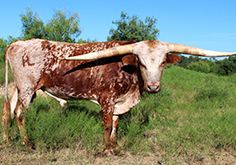 Our bulls meet the Texas Longhorn conformation criteria, as well as our ranch standard for horn length. That means their horns must be a minimum of 65 inches in length tip-to-tip to be classified as a Red Peak Herd Sire. 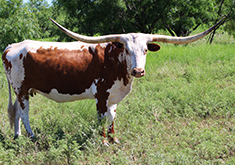 We always have a wide assortment of colors and a variety of ages in our Longhorn herd. All of our Longhorns are for sale - bulls, cows, heifers and calves. Check out the lineup, then contact us for information. Longhorns are very hardy with an average life expectancy of 25 years. In addition, they are very prolific so they consistently calve each year with virtually no problems. These benefits and more make them a very low maintenance cattle breed and that is why we enjoy a large herd.